L-Tron | Ready for Super Bowl LIII? 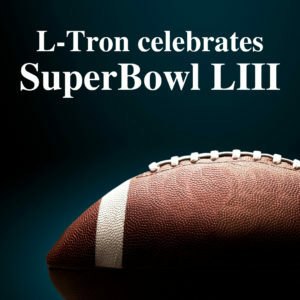 The L-Tron team held an office Super Bowl party in preparation for Sunday’s big game. Super Bowl LIII (that’s 53!) is taking place this Sunday, February 3rd, with kick-off at 6:30pm. The L-Tron team “kicked-off” their in-office celebrations with an all day grazing day on Friday. The only thing we love more than eating is our quirky company culture. While we were excited for the big game, the staff was even more excited to snack (after all, the best part of the Super Bowl is always all of the delicious treats, right?!). The entire team pitched in to bring in treats and lunch. Ken brought in donuts – as a morning warm-up. Gayle & RAD made amazing chili. Juli brought in cheese & crackers. Nate brought in a fruit bowl (so healthy). Elyse made wedge salad dip. Trey made a chocolate football cake. The team took some time to eat lunch together and catch up. We all shared our plans for game day and who we were rooting for to win (the Rams, of course). The entire team also participated in a “memes” contest. Each staff member passed their favorite Tom Brady meme (or football memes) to Juli. The person with the best meme had their desk decorated with memes when they came in Friday morning! The Super Bowl LIII game has the Los Angeles Rams battling the New England Patriots. This year’s game will take place at Mercedes Benz Stadium in Atlanta Georgia. The Atlanta Police Department has been preparing for over a year for game day, they have several security measures in place throughout the city to keep visitors and residents safe. This game will be a rematch the Rams vs. Patriots Super Bowl 17 years ago. A little bit of data for you – this is the Ram’s 4th Super Bowl appearance, while it’s the Patriots 11th. The halftime show this year will feature Maroon 5, Travis Scott and Chloe x Halle. Gladys Knight will be singing the National Anthem to open the game. We hope you have fun this Sunday and enjoy the game, the food and good times with friends and family! Share with us your Super Bowl LIII celebrations – tweet @LtronCorp. Questions? Interested in learning more about Super Bowl LIII or L-Tron’s quirky culture?